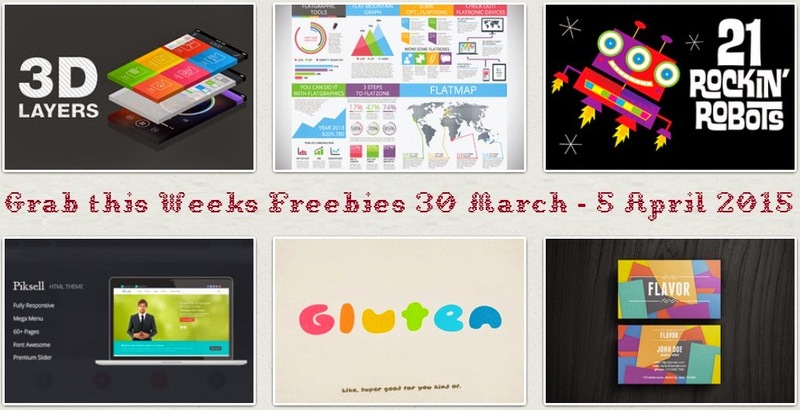 They have released this weeks freebies: March 30, 2015. They’re available until midnight on the 5th April. Grab this weeks freebies from across Creative Market. A more presentable way to display your layers! 3D Layers gives you the power to turn your layers into 3D extrusions with just one click. This weeks free graphics objects on creative market. Flat is new retro so be fancy and make you graphics look awesome! Fully editable vector file saved as EPS-10 and AI CS6, objects contains transparencies. Rescale to any size. All elements shown in the preview are included in download. This weeks free graphics objects on creative market. 21 of the cutest little retro robots you'll find on the web. These adorable guys would love to make an appearance your next design project! This weeks free graphics objects on creative market. Piksell is a multipurpose HTML5 template, it’s fully responsive made with bootstrap 3, works on all main web browsers, tablets and phones. Has many variants pages with 6 different color schemes. Can be used for any type of website; business, corporate, blog, portfolio, etc. Contains 70+ HTML page examples. This weeks free HTML template on creative market. THIS FONT IS DELICIOUS! It's also slightly loud, very round, and 100% fun. It comes in TTF/OTF files with a webfont kit. This weeks free font on creative market. Flavor is a colorful and beauty Business Card template made with care and attention to build up a professional look and help your business be recognized and even more successful. It’s suitable for unlimited types of business such as graphic stores, personal artists, hand crafted article stores, etc. This weeks free graphics objects on creative market. Item Reviewed: Grab this Weeks 6 Free Design Goods 30 March 2015 9 out of 10 based on 10 ratings. 9 user reviews.